AUCD advocates for policies that promote research and training on Autism Spectrum Disorders and enhance services for individuals with autism and their families. 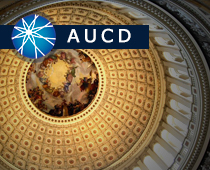 Visit AUCD's Action Center and click on "Current Legislation" to see the the latest bills related to autism. Scroll down to see legislation, resources, letters and related links. The Autism Collaboration, Accountability, Research, Education, and Supports Act - or Autism CARES Act - a bill to reauthorize the Combating Autism Act of 2011. Text of legislation introduced in 2011 related to Autism Spectrum Disorders services. The purpose of the Interdisciplinary Technical Assistance Center (ITAC) on Autism and Developmental Disabilities at AUCD is to improve the health of infants, children, and adolescents who have, or are at risk for developing, ASDs and other developmental disabilities. The Center accomplishes this by providing technical assistance to interdisciplinary training programs (i.e., the LENDs and Developmental-Behavioral Pediatrics (DBP) programs) to better train professionals to utilize valid and reliable screening tools to diagnose or rule out and provide evidence-based interventions for children with ASD and other developmental disabilities. ASA, the nation's leading grassroots autism organization, exists to improve the lives of all affected by autism. This new website is from the CDC who are working to find out how many children have ASDs, discover the risk factors, and raise awareness of the signs. The Centers for Disease Control and Prevention's (CDC) National Center on Birth Defects and Developmental Disabilities (NCBDDD), in collaboration with a number of national partners, launched a public awareness campaign called "Learn the Signs. Act Early." The campaign aims to educate parents about childhood development, including early warning signs of autism and other developmental disorders, and encourages developmental screening and intervention. The purpose of this pilot randomized controlled trial was to investigate the acceptability and efficacy of the Acquiring Career, Coping, Executive control, Social Skills (ACCESS) Program, a group intervention tailored for young adults with autism spectrum disorder (ASD) to enhance critical skills and beliefs that promote adult functioning, including social and adaptive skills, self-determination skills, and coping self-efficacy. Forty-four adults with ASD (ages 18�38; 13 females) and their caregivers were randomly assigned to treatment or waitlist control. Compared to controls, adults in treatment significantly improved in adaptive and self-determination skills, per caregiver report, and self-reported greater belief in their ability to access social support to cope with stressors. Results provide evidence for the acceptability and efficacy of the ACCESS Program. A recent generation of family studies has revealed that autism can be predicted from an array of neurobehavioral susceptibilities that are appreciable before the syndrome is diagnosed, and that each may be traceable to partially-independent sets of genetic variation. Some of these liabilities are not necessarily specific to ASD-those that are non-specific could account for a significant share of the �missing heritability' of autism, would (by definition) contribute to pleiotropy, and relate to so-called �co-morbidities', which are inappropriately named if they actually contribute to (or exacerbate) the severity of autism itself. This study comparee barriers to autism spectrum disorder (ASD) diagnosis and current ASD-related service use among non-Latino white (NLW) families and Latino families with English proficiency (L-EP) or limited English proficiency (L-LEP). The "Autism Town Hall" event, hosted by SPHARC and ITAC, was held at the 2018 AMCHP Annual Conference in Arlington, VA. It provided a platform for current and former Autism CARES grantees, as well as those working at the state systems level and other community members, to dialogue with national partner organizations and each other about priorities and ideas for how to make progress toward a coordinated, comprehensive system of services for autistic individuals. The event was an opportunity to hear from groups working on ASD/DD issues and discuss ways to promote alignment with existing efforts .